The University of Greenwich and National Centre for Research Methods jointly organised a Connecting Communities conference relating to Participatory Arts and Social Action Research. Over the course of two days a variety of talks and performances demonstrated the wealth of research designs and methods. 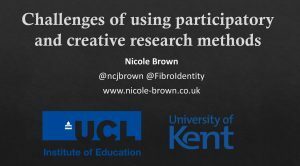 For my presentation I decided to focus on the challenges of using participatory and creative research methods. I briefly introduced fibromyalgia and the approach I have decided to take for my research into academic identity. I introduced the concepts of identity boxes, representations and simulations and provided some examples of raw data that I am working with. I then highlighted the difficulties of using these creative methods for researching academics’s experiences. The presentation was very well received, particularly so because I explored the difficulty of analysing data that is not necessarily traditional in its form and makes for messiness, but then lends itself to being exhibited in arts galleries. In recent years, research reports and articles highlight the benefits of participatory and creative methods in yielding richer data, and in better addressing the power differentials between researchers and the researched. However, reports on problematic issues in relation to the introduction of creative, participatory, collaborative elements are less prominent. In my paper, I explore the challenges and less successful aspects of the making processes and creative methods. My research relates to the construction of academic identity. I attempt to uncover the marginalised voices of the unheard and underrepresented academics diagnosed with fibromyalgia. Fibromyalgia is a complex, contested syndrome characterised by widespread pain, chronic fatigue, sleep problems, psychological disorders and cognitive dysfunctions, and is on the cusp of the physiological, psychological and somatic. To encourage participants to reflect on, make sense of and express their experiences, which are usually difficult to express in words, I use making and doing. Participants complete an identity box, which requires them to find objects representing their responses to questions such as “Who are you?”, “What affects you?” or “How do others see you?”. Whilst the identity box has allowed non-academics to engage deeply in reflective tasks they are not necessarily used to, academics are reticent to embrace creative methods and approaches. This experience of academics struggling with the participatory elements as research participants is in stark contrast to the increased trends towards these approaches. Additional challenges for using creative methods are issues around time and commitment leading to high drop-out rates, which is also due to the disabling and unpredictable nature of fibromyalgia. Drawing on my research data and experience, I will conclude with reflections on the difficulties relating to the role the researcher plays within the triad of research, conversations amongst peers and therapy.